POTEMKIN PICTURES is a fan film FACTORY…having produced about 70 different fan films for six active (and one completed) fan series. You can view all of their releases on their website. 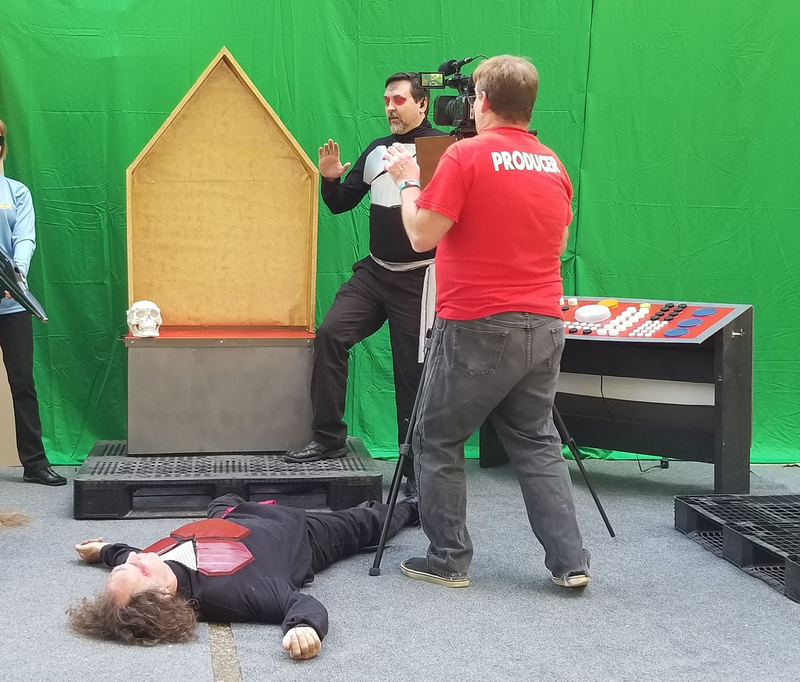 Show-runner RANDY LANDERS manages to release an average run of twelve episodes each year, although last December he finished with a bang, posting four fan films in four days to bring Potemkin’s 2018 total to FIFTEEN fan films! 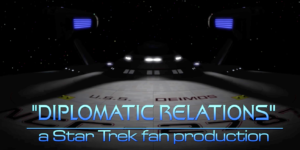 JONATHAN – Well, first of all, Lee, welcome to Fan Film Factor and congratulations on the release of a fan film that you obviously put a lot of work into. LEE – Thanks for supporting our work, Jonathan, and thanks for doing this interview. JONATHAN – My pleasure. 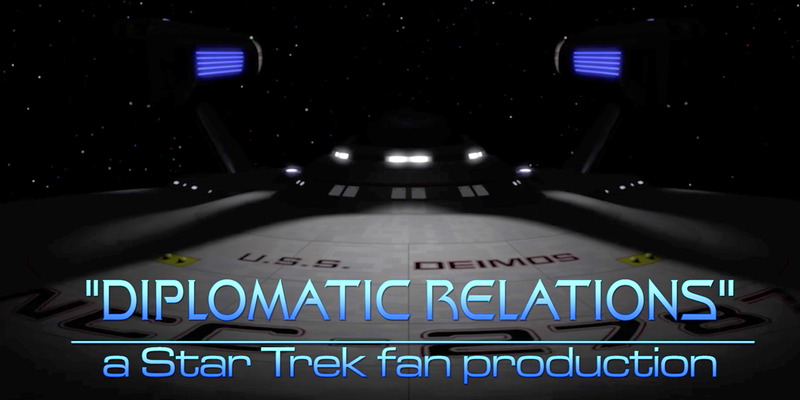 So tell us how “Diplomatic Relations” got its start. LEE – Sure. This project actually started out a few years ago when I first began working with Randy Landers as a cast member in the Starship Deimosproductions. Randy had suggested that the cast should think of some ideas for short vignettes featuring our characters. We had had discussions among each other about our characters’ backgrounds, etc. The actor playing our captain at the time, Terry Self, had decided that his character had been a boxer at the academy. That gave me the idea of a story where we would have to fight our way out of a situation, him using his boxing skills and me using my martial arts. From there I worked out a rough draft of the script and added in the other details such as the Corsarians, etc. I didn’t know if Randy would like it. But he thought the story would be great. He was especially excited with creating a new alien threat for our productions. JONATHAN – So once you had a rough draft of the script, what happened then? 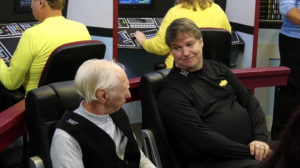 LEE – The script went through several changes, most notably because we had some cast changes. We lost Terry Self as Captain Quinn, so I re-wrote the story to feature our new captain, Mark Stone, played by Tony Anderson. Unfortunately, he was able to only shoot one production for us before he had to re-locate for his job. 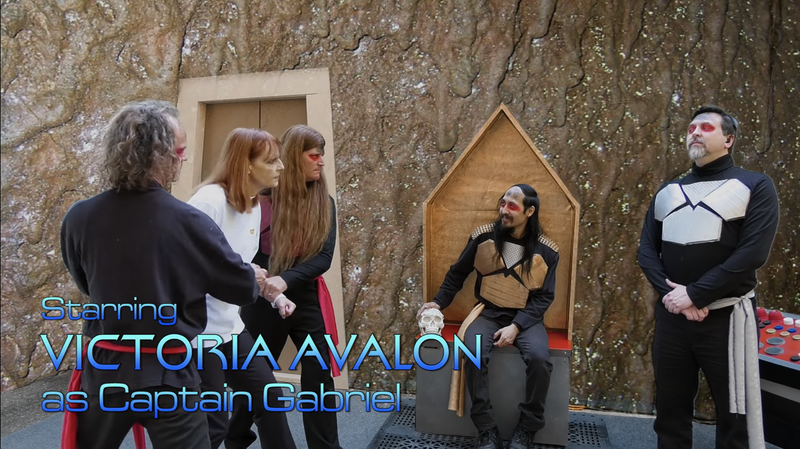 So I had to re-write the story again to feature Captain Gabriel, played by the awesome VICTORIA AVALON. This would be her first adventure since taking over as the captain of the Deimos. JONATHAN – Okay, so now you had a script. What was the next step in making that into a fan film? LEE – We moved on to designing our Corsarian characters. We had to decide on costumes and make-up, etc. Randy originally thought about making them purple with white hair that looked like the lead singer from A Flock of Seagulls back in the eighties. But I thought that was a bit too bizarre, and we really didn’t have the budget for the wigs and that much purple body paint. So I played around with some makeup and, with Randy’s help, came up with the look of the Corsarians. The next step was deciding what their costumes would be. We didn’t have a huge budget, but I wanted the costumes to have a body armor look. I created the look by using pieces cut from an EVA foam floor rug and gluing them to black jerseys. LEE – Yes, it’s those rubbery squares you see EVA foam is pliable and can be somewhat modeled using a heat gun. The silver pieces at the neck were actually cut from place mats that my wife, ANN ELLIOTT DREW, found at a discount store. After that, I painted them with different colors to represent rank. And then they were done. Their captain had some gold epaulets that I made from a silicone baking pad. JONATHAN – Soooo…script? Check. Costumes? Check. Make-up? Check. Time to make a fan film? LEE – Not exactly. As we got closer to filming, we tried to find a suitable set location for the underground lair. I did some location scouting, and found some locations, but we did not have the money for the rent. So we decided that we would have to shoot in Randy’s driveway and use green screen curtains. Not the best solution for a scene like this, but we made it work. JONATHAN – I love low-budget ingenuity! LEE – The next step was to construct the set elements that we would need for the scene. I built the Corsarian control panel using various bottle tops and such to represent the control buttons and knobs. After painting, it looked very much like something you would see on TOS. 6JONATHAN – Yep, I definitely got that vibe. LEE – It also had a really awesome screen lit up by an outdoor laser display. But unfortunately couldn’t be seen in the light we were shooting in. I also spent some time modifying and painting some “space gun” toys so that they could work as the Corsarian weapons. They weren’t really seen much in the production, but I am sure that we will use them again. 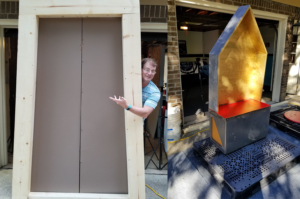 JONATHAN – What else did the “underground”lair (in the driveway) set need? LEE – Other than what I mentioned, the other elements that we made were the main door to the lair, and the Corsarian captain’s chair. I used a steel bench from my workplace as the base for the chair and built up the top so it had more of a throne look. The door was put together very simply, and unfortunately we did not use a track for the sliding doors. It gave us fits during the shoot as the operators could never slide them open correctly! Randy made it work in the final shot where the rescue party comes rushing in by adding some phaser fire on post-production that made it look like the doors had been blasted open. JONATHAN – So now you had the costumes and props, make-up and underground lair. You already had the bridge and captain’s ready room constructed as standing sets that Potemkin producers have been using for years. And NOW you were finally ready to roll the camera, yes? LEE – Not yet. The other element was the cast. JONATHAN – The cast! How could I forget the cast??? LEE – Yep. We needed to come up with the Corsarian captain and his crew. We cast several of the Corsarians when we had our Potemkin Pictures Open House in mid-September of last year. 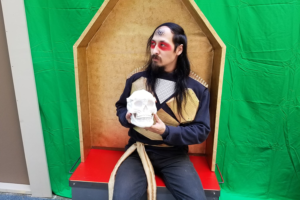 KODAI YAMAGUCHI was cast as the Corsarian captain—he had such a unique look that we knew he would work great in the role. KODAI YAMAGUCHI as the Corsarian captain. JONATHAN – So when did you actually start shooting? LEE – We shot it back in October. The majority of it went pretty fast, the day of shooting had its share of challenges. In addition to bringing everyone together for the first time to shoot this production, we also had to re-shoot a major scene for our production of “Where They Have Gone We Follow” (which if you haven’t seen, I highly recommend watching as I think it is one of the best stories that we have done). 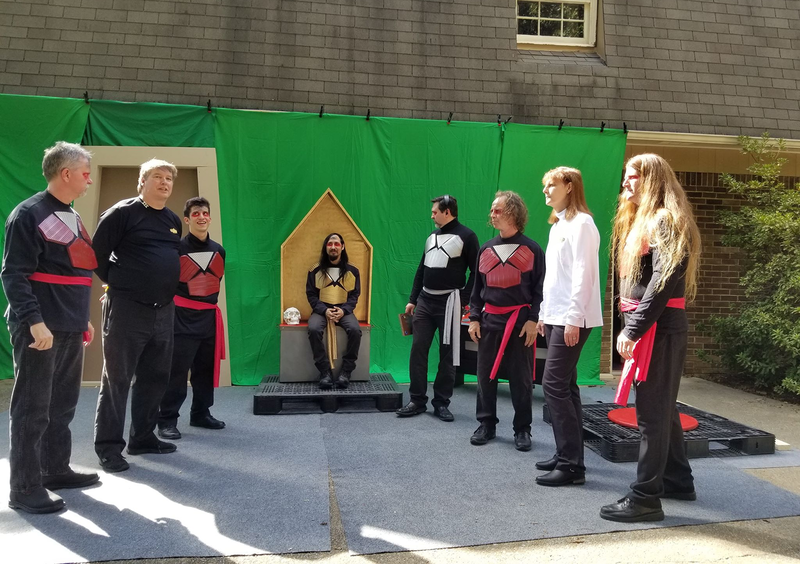 Anyway, we needed to do this re-shoot, and it turned out great, but it really cut into the time that I needed to work with the cast on the fight choreography etc. Still, with Randy behind the camera, we worked hard to finish our shoot. JONATHAN – Can you talk a little more about the fight scene? Randy said you choreographed everything? How did you teach the moves to the cast members who were involved in the fight, and how long did you spend teaching them? LEE – As I mentioned before, I originally wrote the script with Terry Self in mind in his role as Captain Quinn. Part of the back story for his character was that he had been a boxer back at Starfleet Academy. With that in mind, I wanted to showcase that in a classic “Kirk-fu” fight. 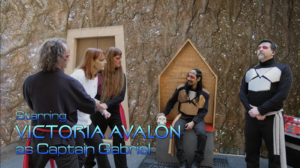 By the time we were ready to produce this story, the casting had changed and Victoria Avalon was our new captain, so I had to re-think a few things. I have a background in Martial arts, and experience with stage combat. 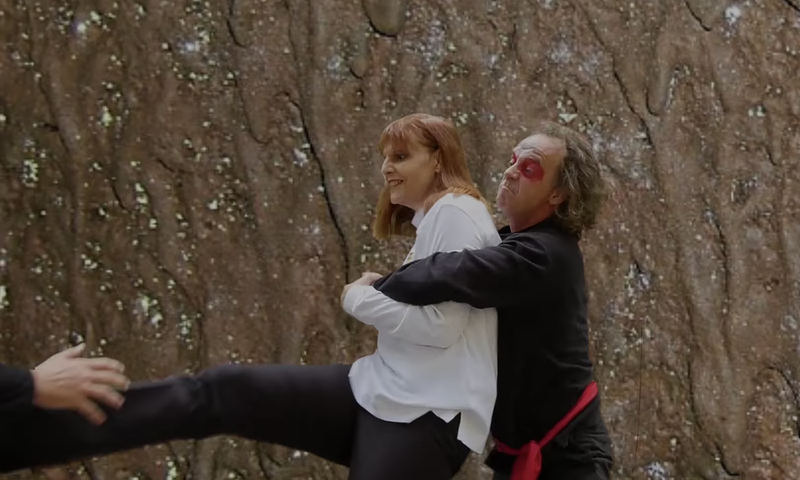 Now normally, when doing choreography like this, you would get quite a bit of time to work with all of the actors to work out the moves that work best for them, and to work out the timing and the angles needed to help sell the fight. Unfortunately, this would be a one-day shoot, and would be my first chance to work with the cast. To make matters worse, as I said, we had to split the day to re-shoot a scene for “Where They Have Gone We Follow.” After we finished that shoot, I only had about 20 minutes to rough out the fight scene! LEE – The other problem was, of course, that I was in the scene…which made it impossible for me to be behind the camera to see the angles, etc. LEE – Still, we did the best we could under the constraints. Randy came out and set up the camera, and said, “Show me what you got.” So we went through the choreography that we had roughed out several times until he had a good idea of what it was going to look like. We had a lot of fun with this shoot. It was nice to have a little action after some of the more dramatic stories we had done lately. Overall, I was pleased with the end result. By the time it was edited and sound added in, it really came together. And I learned some lessons for next time. LEE – He was mainly on his own. I did see some of the raw footage. And as he would come up with the rough cuts, I would make suggestions along with our other producers. Randy was always careful to ask for my input. I think that Randy did a great job with the editing. While there is never enough time to get everything perfect, I am very happy with this production and we all had fun shooting it. JONATHAN – How long did editing and post-production take to complete? LEE – About four months total, which is typical for an episode. We had to wait a bit for the music and sound editing and some of the VFX shots like the beautiful opening shot of the Deimos orbiting the planet. JONATHAN – Yeah, I definitely liked that shot. LEE – A lot of effort goes into a production like this, and I am very proud of our cast and crew for all of their great work. I hope our viewers enjoy this production and have as much fun watching it as we had shooting it.